A German town is looking for someone with some way to evict a giant catfish who’s eaten all his fellow fish in a city-owned pond—and begun to eat the ducks. I will solve this problem by inviting this cool guy to become my roommate and wildest pal. The roughly 1.5-meter (4.9-foot) fish has been making waves in Offenbach, near Frankfurt. 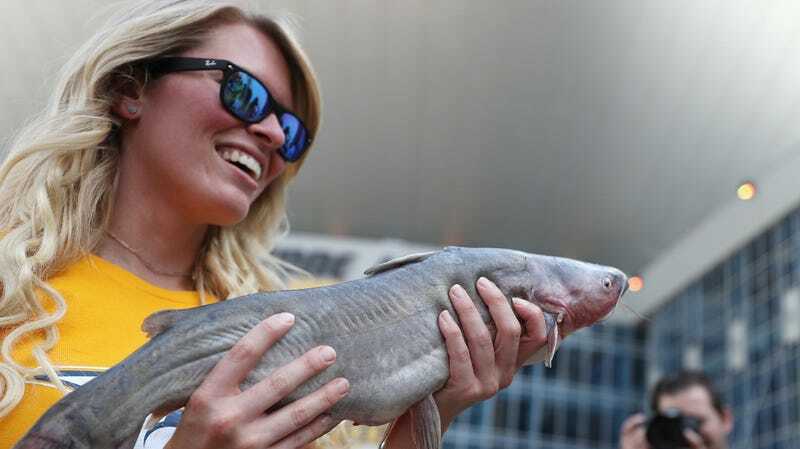 News agency dpa reported that the city government said Monday that it has found a professional angler to catch the fish, first seen about a year ago, but a formal contract has yet to be signed. They see a nuisance; I see a companion for any and all capers. Late-night movies, sporting events, eventful and hilarious nights on the town made more eventful and hilarious by my most adventurous friend who’ll do anything for a laugh and a good time. They’re hoping to remove this champ to a “private pond somewhere,” but “officials will first have to be satisfied that it can’t escape into flowing water and that its new home is suitable for a catfish.” Sounds like my bathtub! What's with Germany and the fish, anyway?